The Bar at Taj Boston oozes old-world charm. 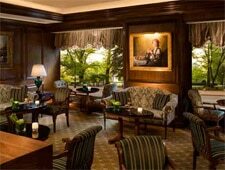 : Classic elegance and an old-world vibe prevail at this stately gentleman's club-like bar, with its fireplace, expanses of dark wood and upholstered, overstuffed armchairs. Tourists and locals alike flock here for strong martinis and to consider an extensive Champagne menu. Service is over the top, as befits the setting. Order a gin and tonic and you'll receive a carafe of tonic water to adjust the strength of the gin to your liking. While the drinks menu takes center stage, light fare is offered too, including classic American snacks such as chowder, Caesar salad and Boston cream pie. Sit back and relax knowing you’re in the hands of professional staff and enjoy a clear view of the Public Garden.